Philips 47PFL7404 review | What Hi-Fi? The 47PFL7404 has most of the ability of Philips’ most expensive sets, with a far lower price tag – what’s not to like? There's no denying Philips makes some of the highest-end TVs around, but if you can't stretch to the range-topping 47PFL9664, you can opt for this, the much more affordable 47PFL7404. In fact, even if you can stretch to the pricier set, there's a very compelling argument for choosing this one anyway. For a start, pretty much every Philips TV is a premium proposition, so although the 47PFL7404 does without the brushed metal touches of the more expensive set, it's still one of the most stylish, well-built units we've seen for a while. Money has to be saved somewhere, though, so you do without Ambilight here, and the motion processing is 100Hz, rather than 200Hz. You also do without an Ethernet connection and fifth HDMI. If any of these things are vital to you, perhaps you should click away. 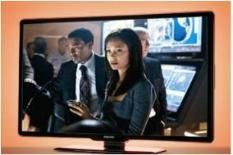 But if you can live without some of the more technical specs, read on to find out why this is the better performance-per-pound TV. Playing The Young Victoria on Blu-ray, it's clear this is a very capable performer. The Philips digs up all the detail in the period dresses, and this combines with excellent edge definition to create a palpably full and solid picture. This solidity remains almost entirely intact during motion, too. In fact, there's not a great deal of difference in terms of motion handling between this and the '9664 – meaning that although there's the odd smidge of smear, it's not far off its closest rivals. This Philips doesn't have the very deepest blacks, but the amount of punch it produces renders sparkling jewellery with scintillating realism. Pure whites and vibrant colours help here, but there's also enough subtlety to ensure natural skin tones. This colour subtlety and superb detail recovery should be the perfect combination for standard-definition, and so it proves: Brokeback Mountain's scenery is punchy and three-dimensional without over-exaggeration, and the bright colours of CBeebies' Mister Maker are vibrant without appearing garish. The performance is rounded out with audio that, while not particularly full bodied, is fairly detailed and clear by flatscreen standards. The 47PFL7404 offers much of what makes the 47PFL9664 so good, yet for £600 less. It's hard to argue with that.